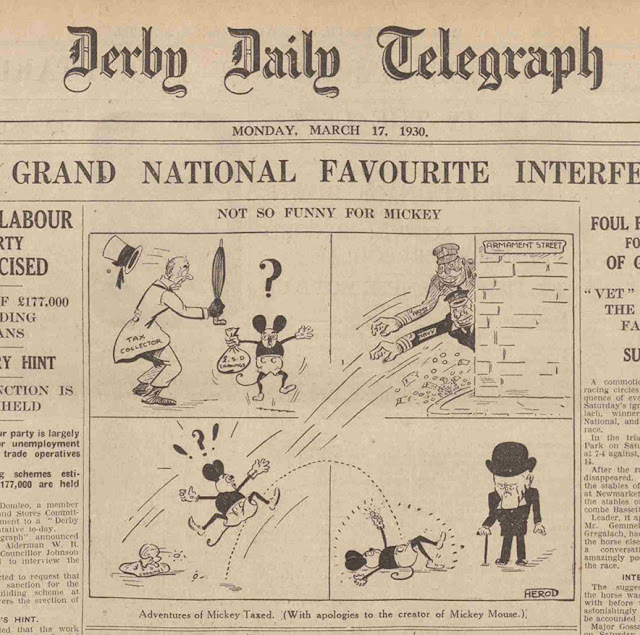 The first daily strip serial with Mickey Mouse started March 17, 1930 in the British Derby Daily Telegraph. 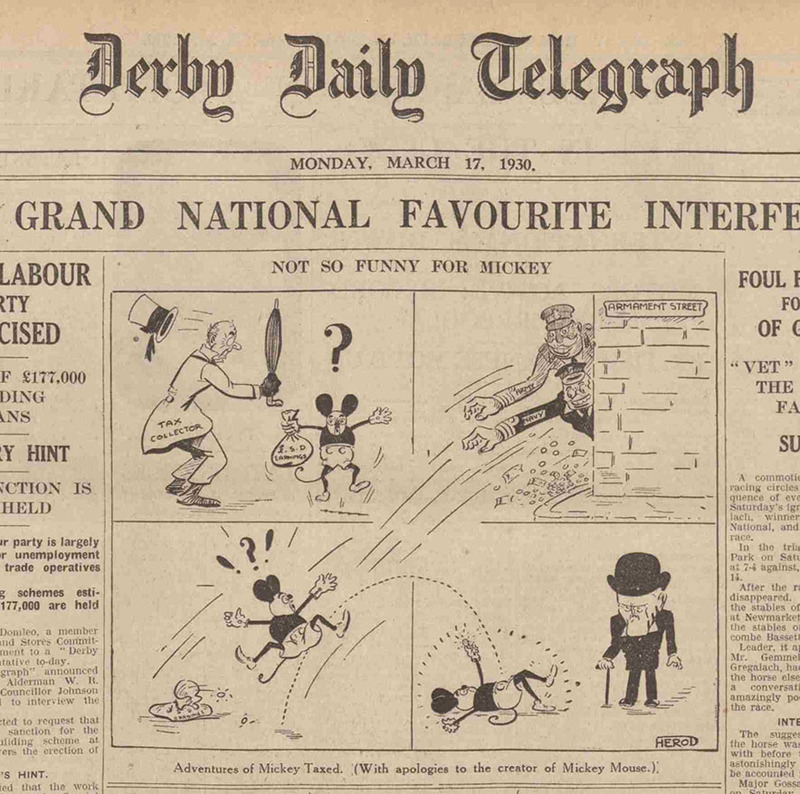 Only two months after the first American print, it might be one of the first British newspapers to have the Mickey strips. Before the first comic strip, the newspaper was advertising the adventures of Mickey and his wife Minnie for more than a week. In the same newspaper as the first strip, they also got a little bonus comic on the last page. Probably made by a local illustrator they got the adventures of Mickey Taxed, "with apologies to the creator of Mickey Mouse". I'm not sure if the caricature comic is referring to a recent event or just generally to the Great Depression and economic situation at the time. But the person on the last panel is probably a caricature of a politician (didn't manage to find out who). Interestingly enough, the first Swedish Mickey Mouse strip was published at the exact same date. I wonder if that was intentional. King Features propably had a sale drive and offered Mickey to their european customers about the same time. The swedish strips were a bit altered, though. That's an interesting observation. The first strips weren't printed until June 7, 1930 in Norway - but then as an entire page of strips in a weekend attachement to the newspaper. Yes, I got a digital copy of the first Mickey-strips printed in Norway. That's actually a good idea for a post on this blog, there are som interesting things to note about the early strips (not just for Norwegians), so I'll try to write some text with scans soon.